Injected hair systems have been gaining favor in recent years. There are no knots on the base, so the hair looks like it is growing out from the real scalp. Lordhair produces three types of injected hair system. It’s the most common injected hair system. 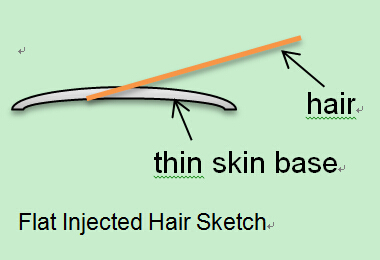 The hair is injected into the base at a low angle into the skin base (see sketch below). The hair looks as though its growing out from real scalp, but rests flat on the scalp. Flat injected hair systems are available in medium heavy density, but the hair length can't be too long, 12” or less. The lifespan of flat injected hair systems are about 1-3 months. The shorter the hair is and the lighter the density is, the longer the hair systems will last. Lift injected hair systems is a step up from flat injected hair systems. 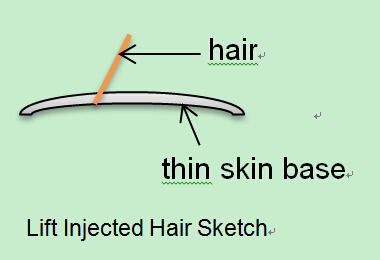 Flat injected hair systems cannot be combed in different directions because of the flat nature of the hair, but lift injected hair systems can be combed in different directions and the hair looks fuller than flat injected hair (see sketch below). However, lift injected hair systems are less durable than flat injected hair system, because the hair root does not hold as well as flat injected hair systems. Medium is the heaviest density available on lift injected hair systems. Similarly, the hair can't be too long; otherwise the hair will shed. The lifespan of lift injected hair systems is also 1-3 months. 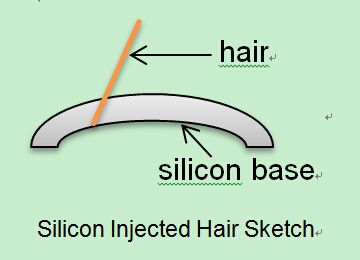 Silicon injected hair systems are not as popular as thin skin injected hair systems, because of their thick bases. It’s about double the thickness of the thin skin base and much stiffer than thin skin (see sketch below). The cost of this design is more than thin skin injected hair systems. This design enjoys great popularity in Italy. The hair can be flat injected or lift injected; the density can be heavy on silicon injected hair systems; and the lifespan is much longer than thin skin injected hair systems. If you are not familiar with this design, please choose carefully and consult us before you place an order. Generally speaking, if you are looking for a natural looking hair replacement system and are not too concerned about durability, you should try an injected thin skin hair system.